The graph shows a 50% decline in Arctic sea ice extent from 1979 to 2012, though they do not specify any units on the y-axis. 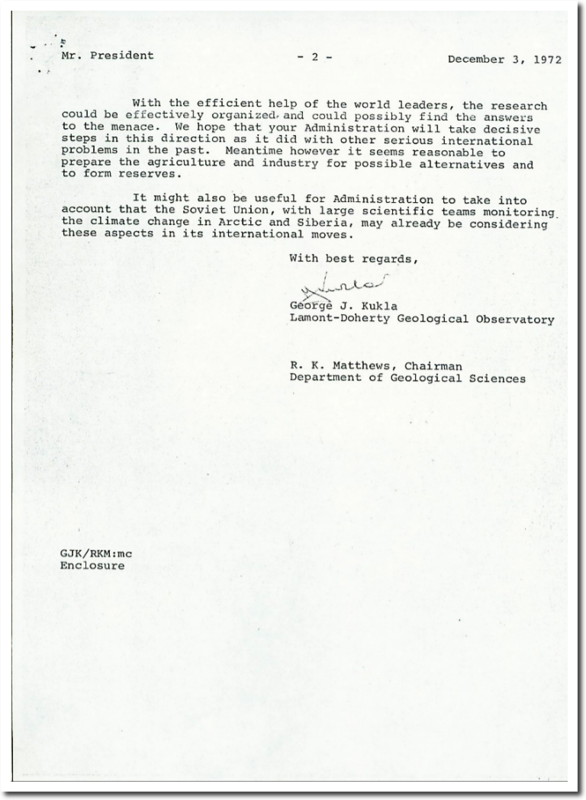 The claim that satellite record begins in 1979 is incorrect, as the 1990 IPCC report showed NOAA satellite sea ice data since the early 1970s. satellite observations have been used to map sea-ice extent routinely since the early 1970s. 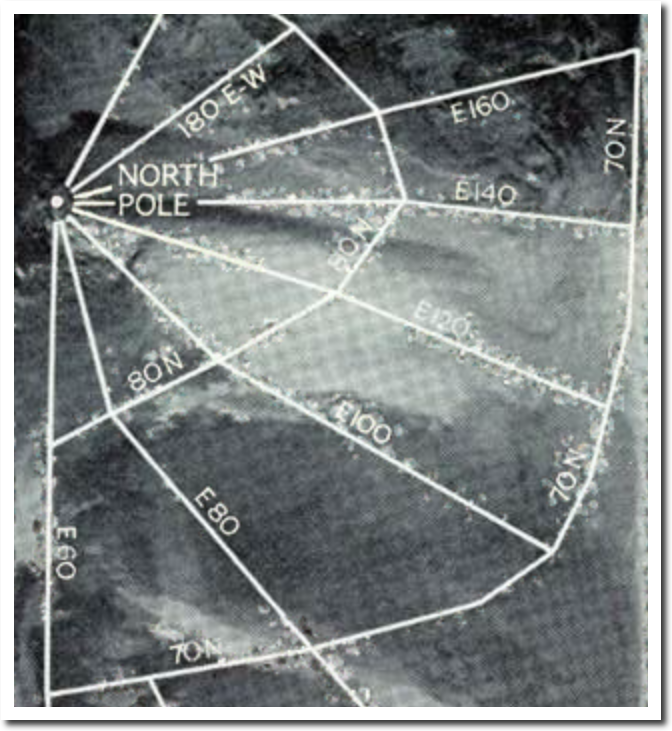 The American Navy Joint Ice Center has produced weekly charts which have been digitised by NOAA. 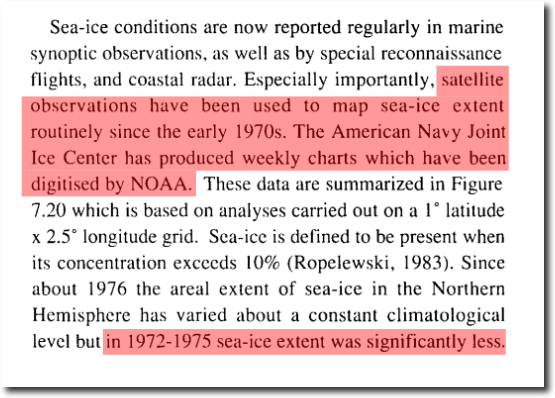 in 1972-1975 sea-ice extent was significantly less. NOAA and the National Climate Assessment are hiding the pre-1979 data, probably because extent was “significantly less.” The figures below from the 1990 IPCC report, show the data which is being hidden. 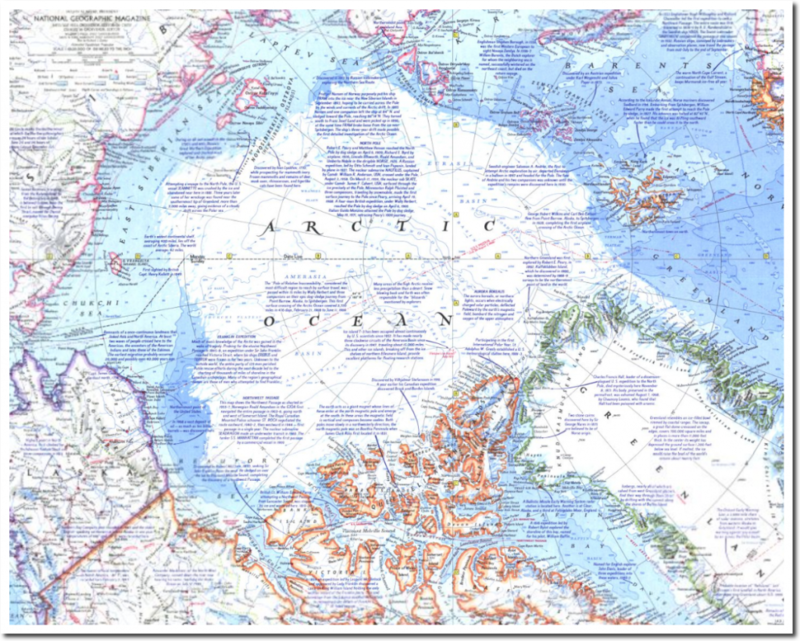 In 1971, National Geographic published this map of Arctic sea ice. Let’s compare that with ten years later, at the minimum on September 16, 1981. There was a large expansion of Arctic sea ice over the decade from 1971 to 1981. 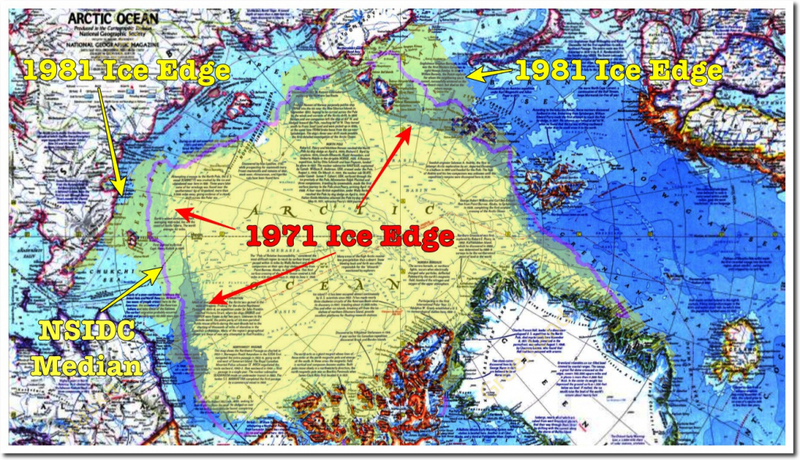 The 1981 ice edge extended hundreds of miles past the 1971 ice edge. 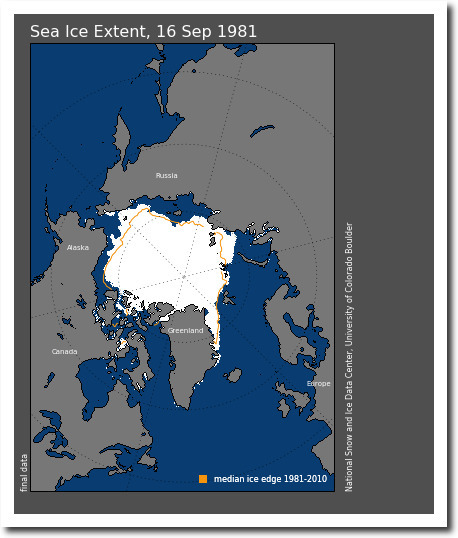 Even more telling is what NSIDC describes as the “1981-2010 median ice edge” – which extends far outside the 1971 edge. 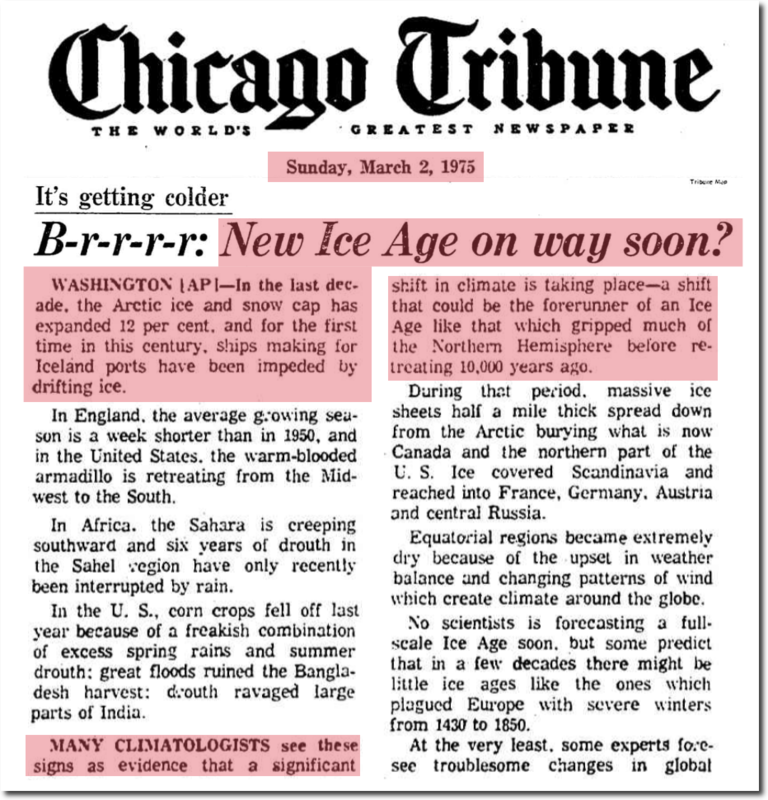 It is clear there was a lot less ice in 1971, which is why NOAA, Katharine Hayhoe, Michael Mann and their cohorts at the National Climate Assessment don’t want you to know about it. It shouldn’t surprise anyone that we have satellite data for Arctic sea ice ice prior to 1979, because we went to the moon in 1969. 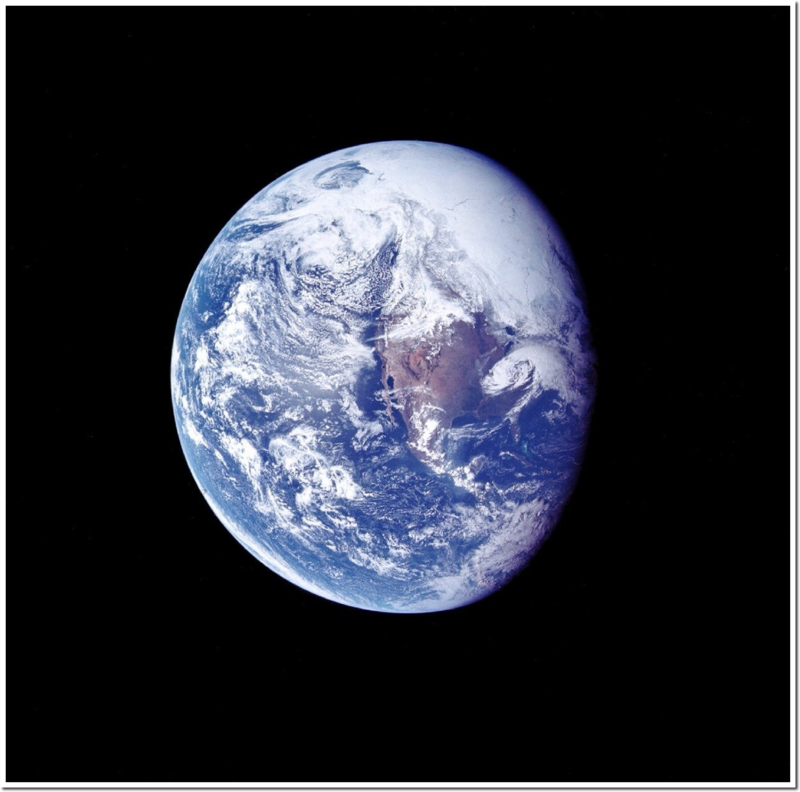 Here is a beautiful photo of Arctic sea ice taken by Apollo 16 in 1972, seven years before 1979. 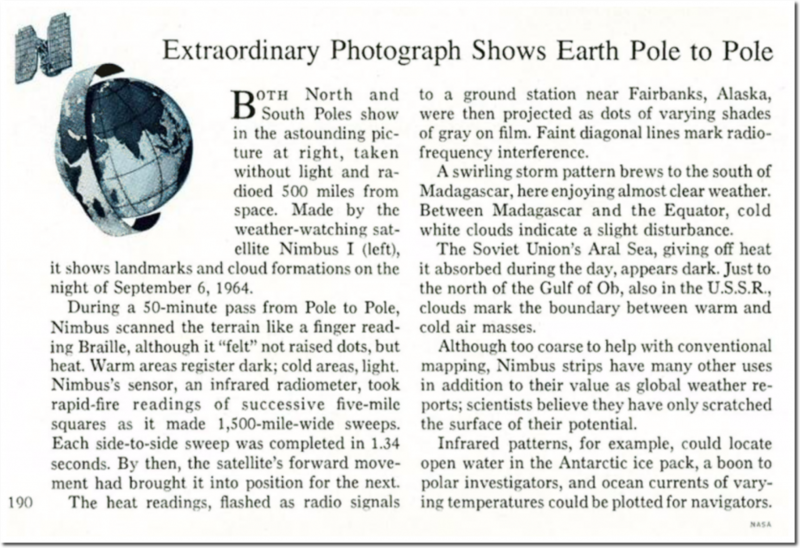 In 1965, National Geographic published Arctic satellite imagery – fourteen years before the fake National Climate Assessment start date of 1979. 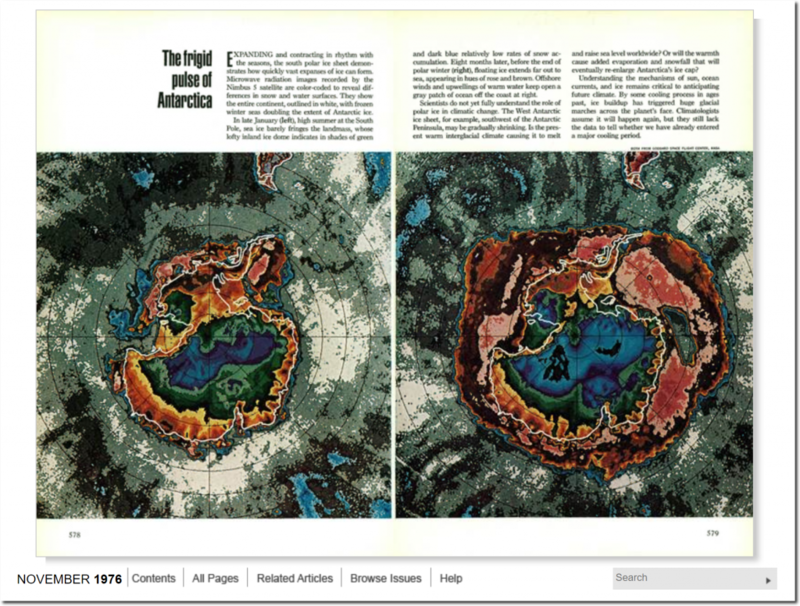 This satellite imagery of Antarctic sea ice from 1976 shows how detailed the data was, and also shows that there was almost no Antarctic sea ice remaining during the summer – near the peak of the 1970s ice age scare. But the data hiding story gets even worse. 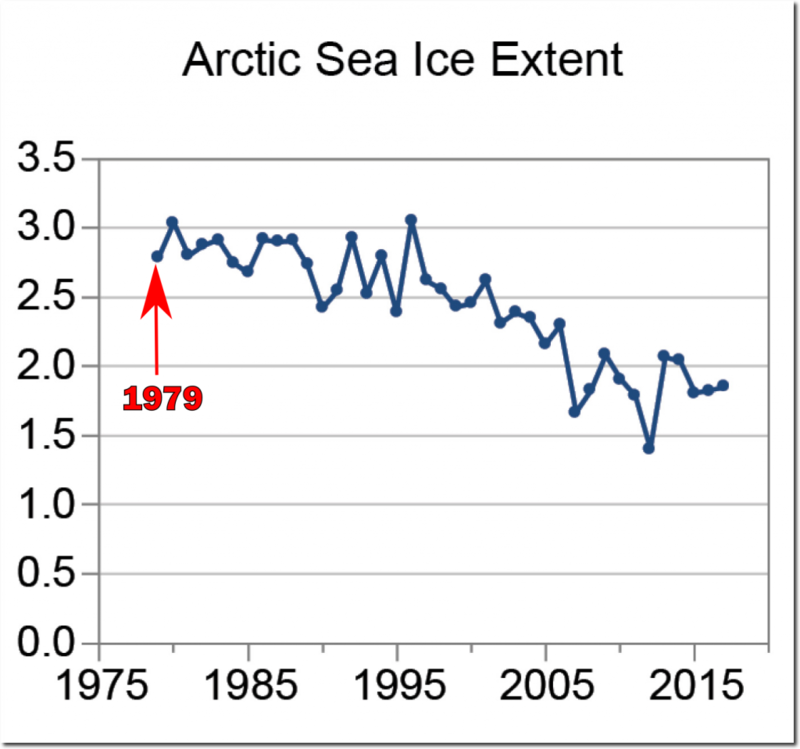 During the decade prior to 1975, Arctic sea ice extent increased by 12% – so extent was even lower prior to 1975. By 1975, Icelandic Ports were blocked with ice for the first time in a century, and climate scientists were warning of a new ice age. So we know that sea ice extent was much lower prior to the 1970s. 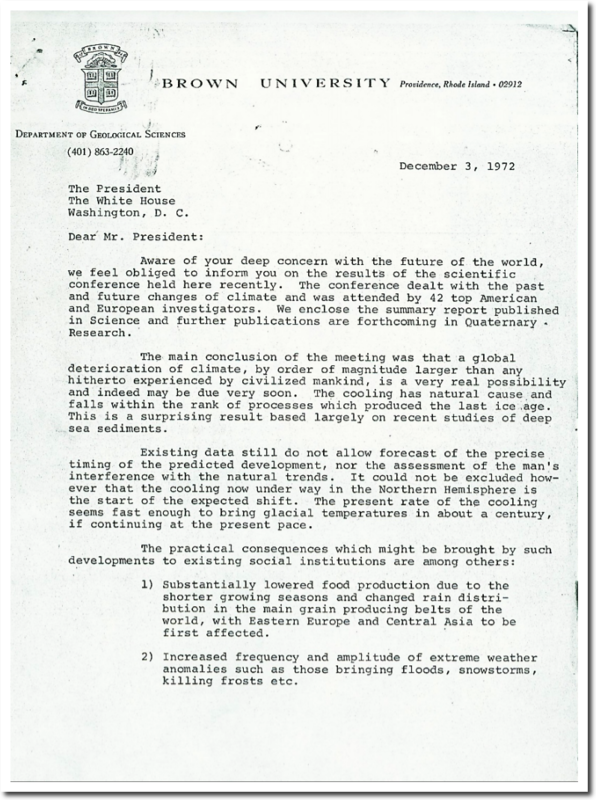 In 1972, forty-two top American and European scientists sent a letter to President Nixon warning of a new ice age within a century. By 1970, the US and Soviet Union were worried about a new ice age, and ominously thickening Arctic sea ice. The 1985 DOE CO2 report was the predecessor of the IPCC, and shows that extent was very low in the 1950s, and then began to increase rapidly in the 1960s and 1970s – triggering fears of an ice age – as I will document shortly. 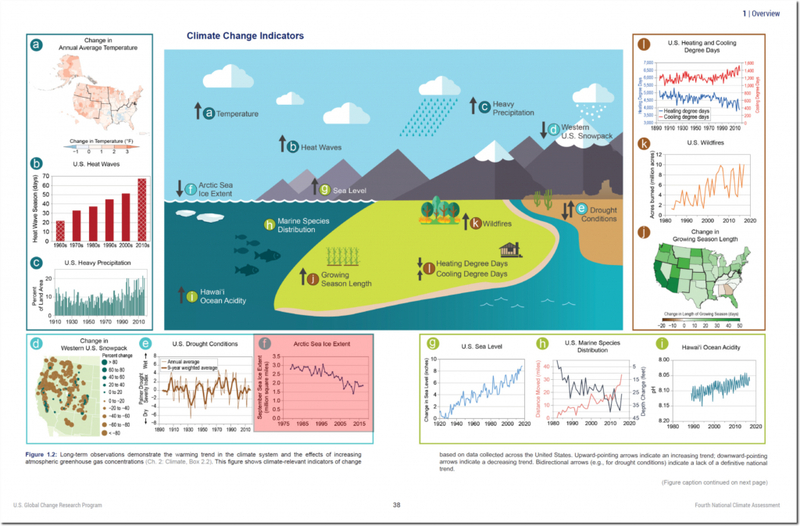 If we combine the 1985 DOE graph and the 1990 IPCC graph at the same scale on both axes, it becomes clear why NOAA and the National Climate Assessment start their graphs in 1979. 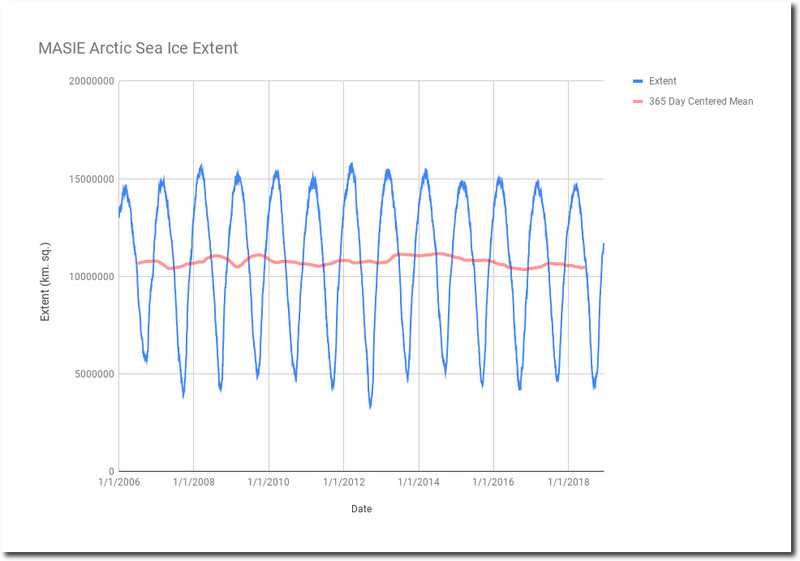 That year was the high point of the last century, and by cherry picking a high point, they can mislead readers into believing sea ice extent is trending linearly down. If they showed the entire series, it would become clear that current sea ice extent and thickness is comparable to the 1950s. 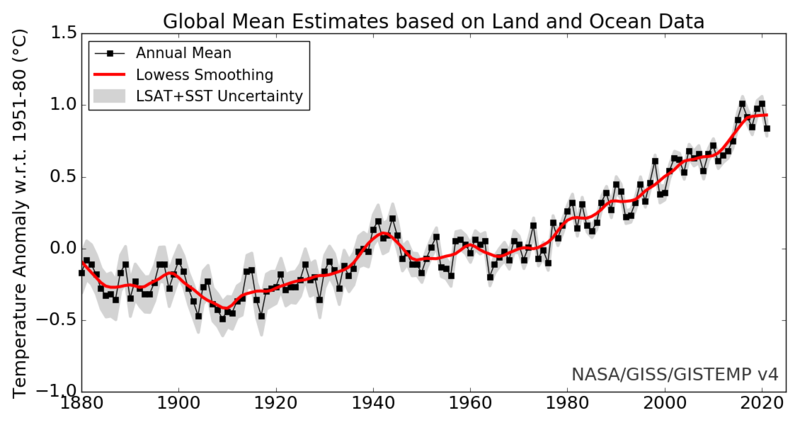 Historical data confirms the warmth and low ice extent of the 1950s. 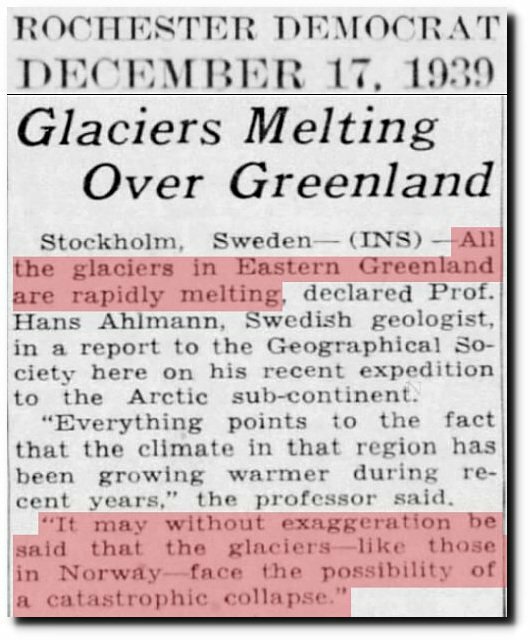 Sixty years ago, the New York Times reported that the polar ice cap had lost 40 percent of its thickness and 12 percent of its area, and were predicting an ice-free Arctic within a generation. Although the idea that a solid ice sheet covers the central Arctic has lingered stubbornly in the popular fancy, the northern cap of ice worn by our planet is actually a thin crust—on the whole, only about seven feet thick—over an ocean two miles deep in places. 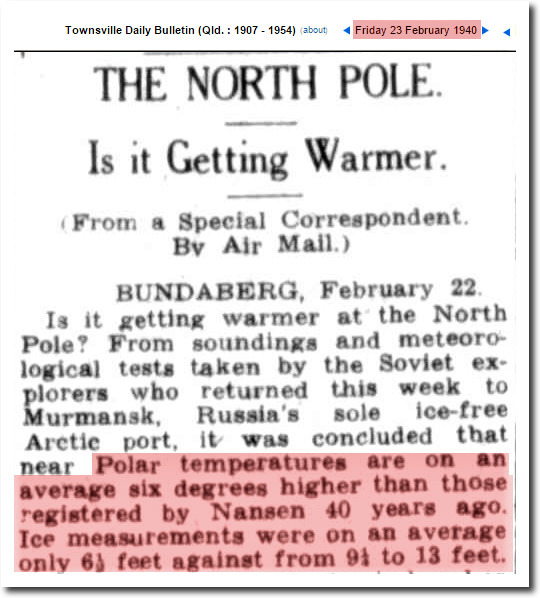 Polar temperatures are on an average six degrees higher than those registered by Nansen 40 years ago. Ice measurements were on an average only 6½ feet against from 9¼ to 13 feet. 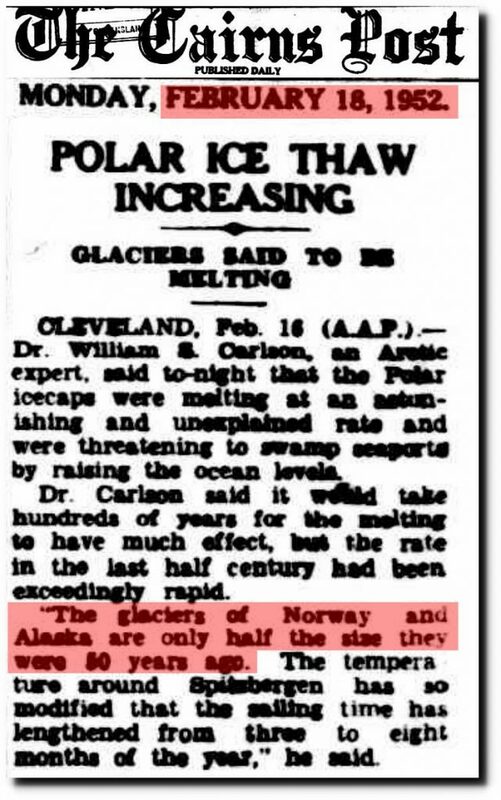 Arctic sea ice was the same thickness in the 1940s and 1950s as it is now – two meters. Sea ice expanded rapidly in the 1960s and and 1970s, but from the 1920s through the 1950s, the Arctic was having a meltdown. 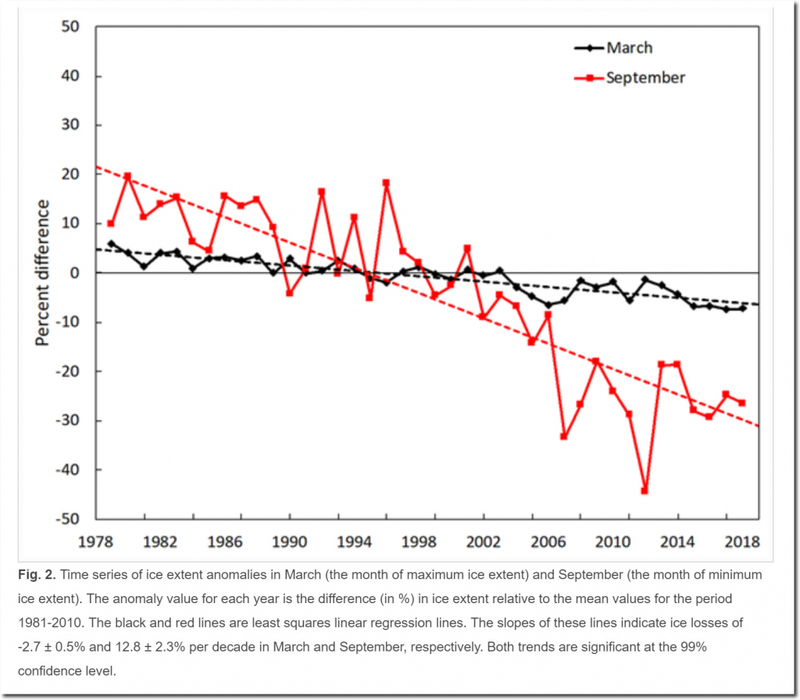 Evidence is overwhelming the Arctic climate and sea ice is cyclical, and raw, untampered data shows this is true. 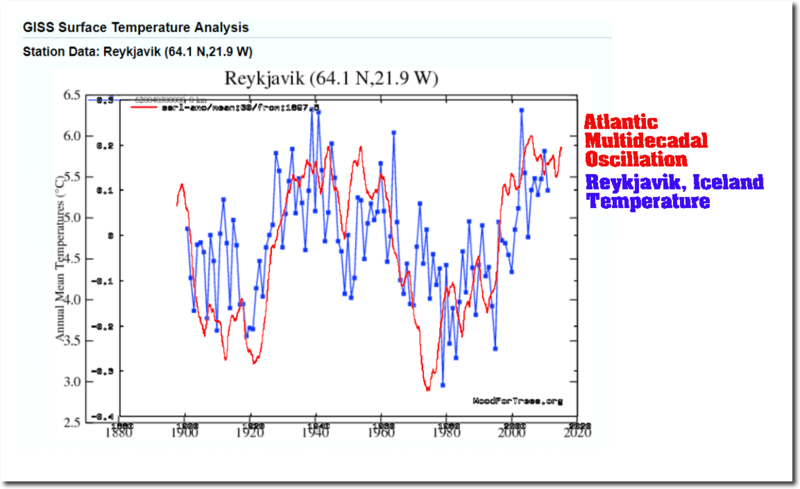 The NASA graph below of Reykjavik, Iceland temperatures shows why NOAA and the National Climate Assessment start their graphs in 1979 – which was the coldest year on record in Iceland. 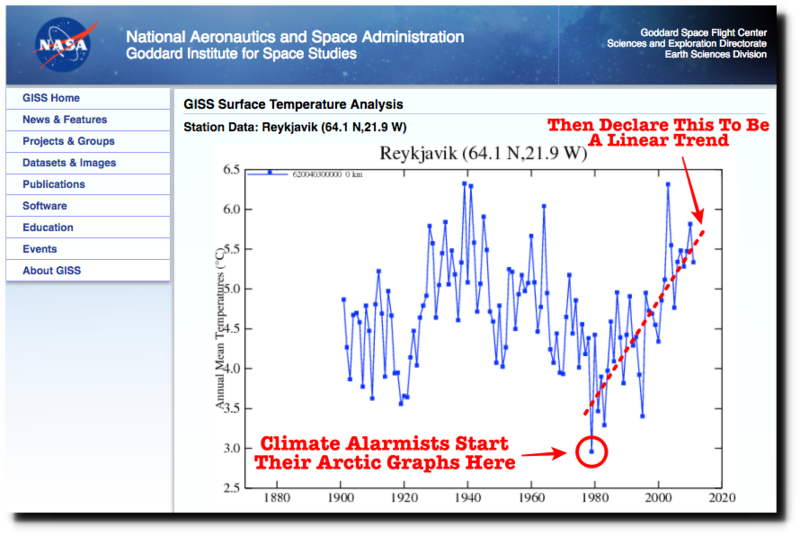 By starting their sea ice graphs in 1979, alarmists can fool people into believing sea ice extent is driven by CO2, instead of oceanic cycles. 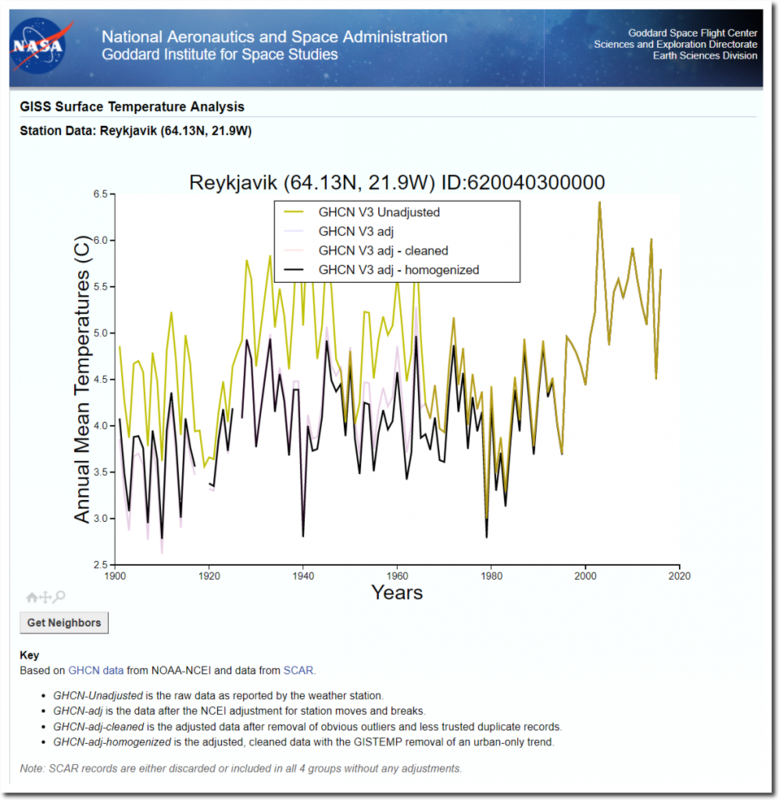 The reality of Arctic climate ruins the global warming scam, so NASA now tries to hide the past warmth of the Arctic – by tampering with the data to cool the past. 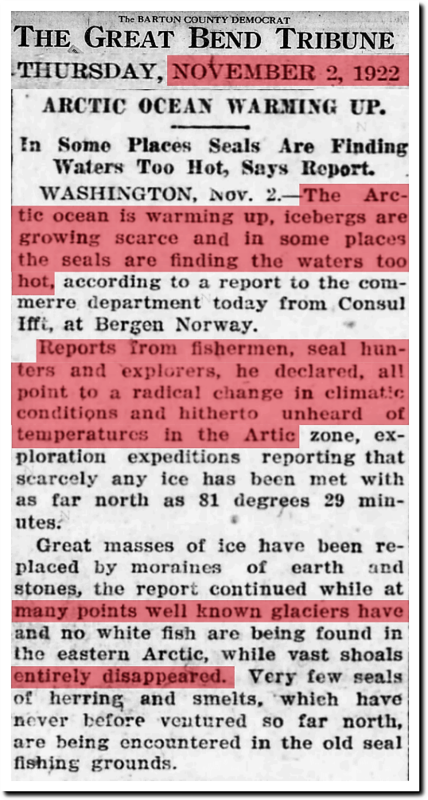 Climate scientists have been consistently wrong about the Arctic for 100 years, and all of their predictions have failed. 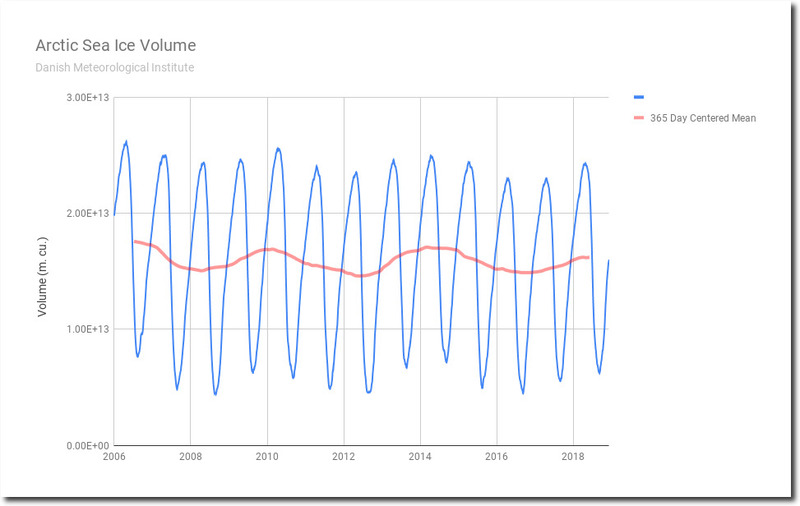 There is no indication anything has changed in the Arctic, other than normal 60 year cycles – but climate scientists have huge amounts of funding dependent on demonizing CO2 for politicians. So they lie, cheat, hide data and tamper with data. 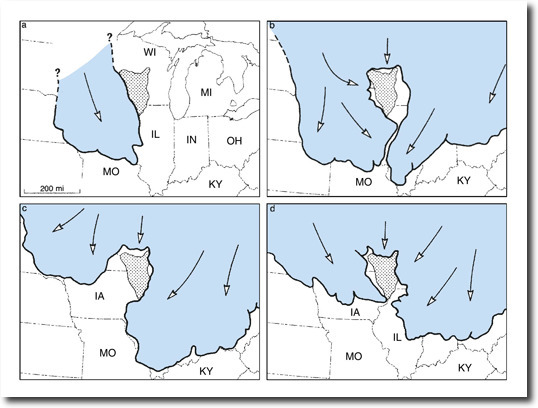 Twenty thousand years ago, Chicago was covered with a mile of ice. CO2 was much lower than it is today. Six thousand years ago, the Arctic was ice-free. CO2 was also much lower than it is today. 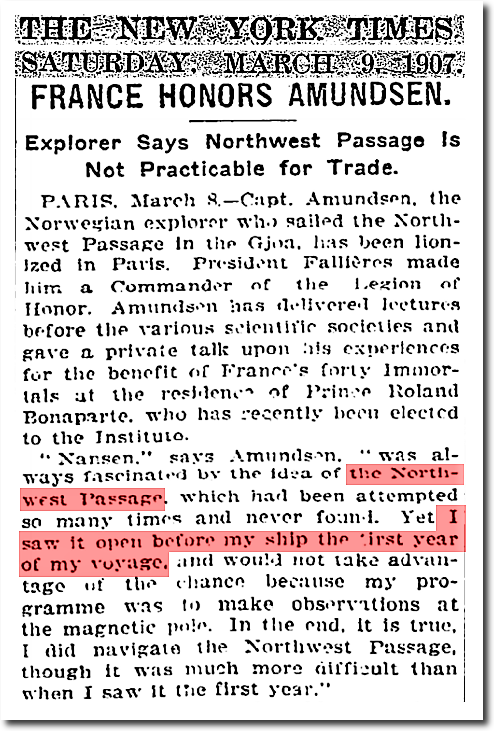 The Northwest Passage was open in September, 1903, which NASA describes as one of the coldest years on record. 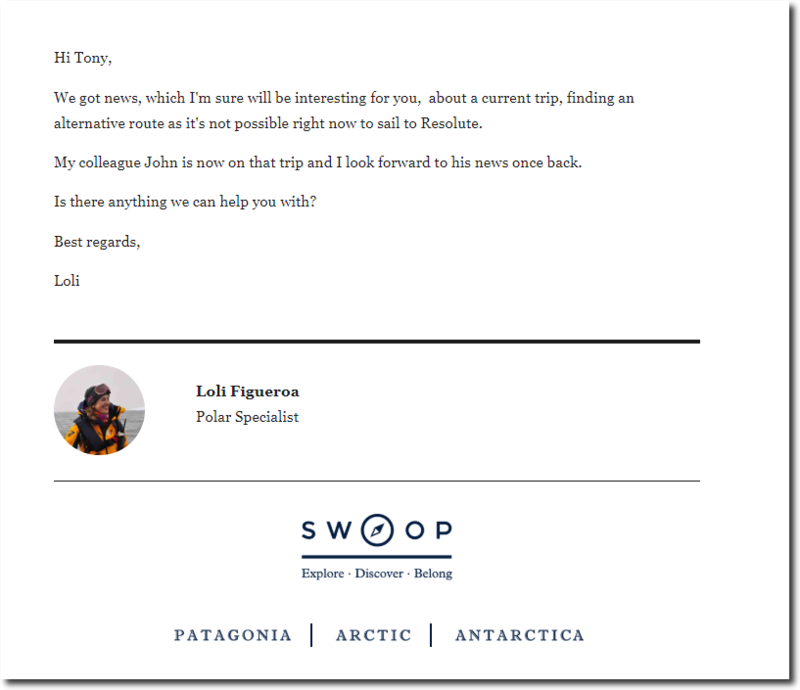 I saw it open before my ship the first year of my voyage, and would not take advantage of the chance because my programme was to make observations at the magnetic pole. The Northwest Passage was not open this year. The Northwest Passage was open during one of NASA’s coldest years on record, but was blocked with ice this year, which NASA says was one of the hottest years on record. 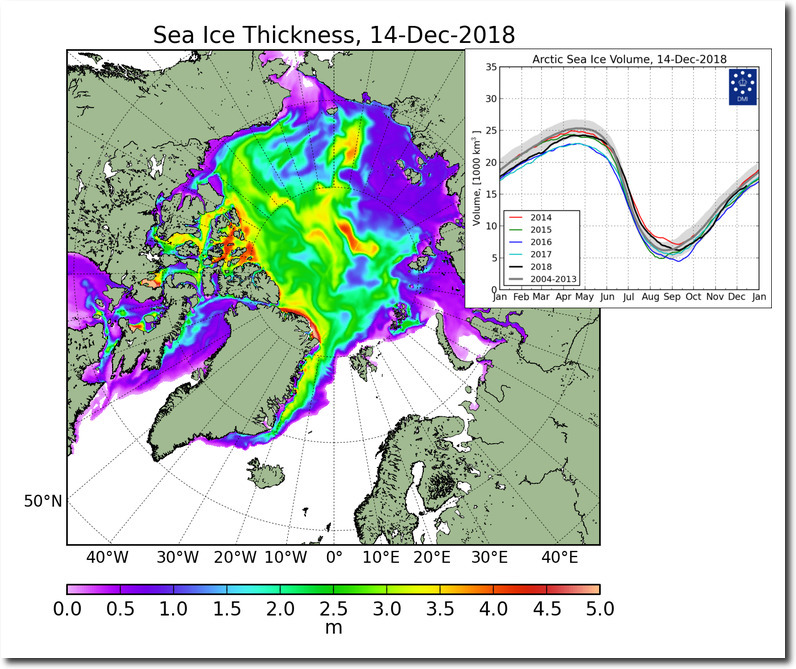 There is no evidence CO2 has any impact on Arctic ice, but huge amounts of evidence that government climate scientists are defrauding the public.